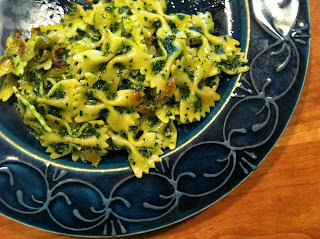 The kale pesto would have been amazing enough on its own, but combining it with the sweetness of the caramelized onions put it over the top. To start, slice a couple of onions and sauté on medium high heat with some butter or oil, and a teaspoon of sugar. Stir the onions occasionally so they brown evenly. In the meantime heat a large pot of salted water while you’re deveining your kale, I like to use the same water for both blanching the kale and cooking the pasta. Blanch the kale for a minute then scoop it into a colander and drain thoroughly by squeezing it like a sponge once it has cooled down a bit. While your pasta is cooking start the pesto in the Cuisinart with two cloves of garlic, some kosher salt, and a handful of pine nuts. Once minced add your drained kale and with the motor going drizzle in your extra virgin olive oil until you get the desired consistency. Grate in some fresh parmesan, salt and pepper to taste, one final pulse, and you’re ready to combine all of your ingredients for the perfect late summer pasta.